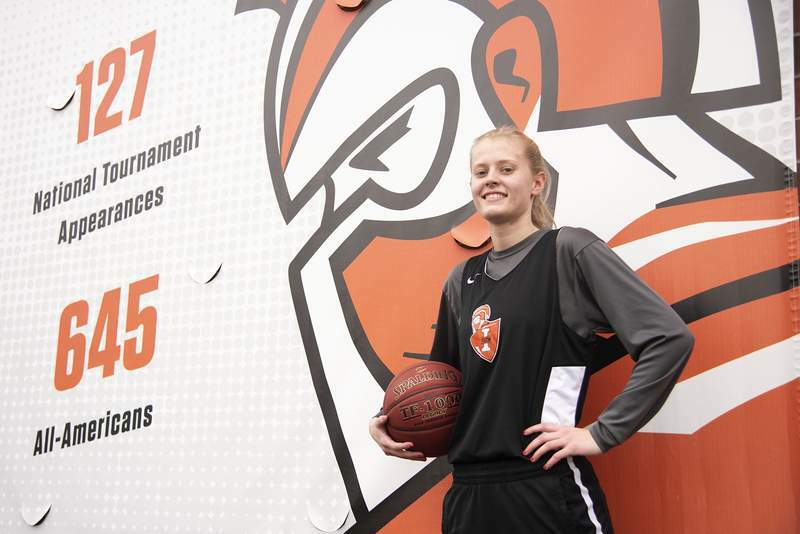 Brett Luke | The Journal Gazette Senior Kendall Knapke is averaging 14.9 points a game to lead the Indiana Tech women's team, which is on a 16-game winning streak. An 81-63 loss to then-No.4 Marian on Nov. 1 looked to be cause for concern for the then-No.9 Indiana Tech women's basketball team. But a 16-game winning streak quickly put that concern to rest for a team now ranked third in the NAIA. Not just good, but great as the Warriors (17-1, 9-0 Wolverine- Hoosier Athletic Conference) have the top scoring offense and No. 2 scoring defense in the conference and are winning by an average of 24 points. The winning streak is the third longest in program history just behind an 18-game run last season and 20 straight in 1991-92. Indiana Tech plays host to Siena Heights (14-7, WHAC 7-2), which has been receiving votes in the NAIA Coaches Poll, tonight at the Schaefer Center. The senior forward from Hoagland is averaging 14.9 points and 6.5 rebounds this season. Knapke's a threat from beyond the arc but can take it to the basket, putting teams in tough spots on defense. She's not the only scorer. Tech has two other players – DeAnn Kauffman and Alexis Hill – who are scoring in double figures. “Last year we had a couple players who defenses could key in on, and this year everything is more spread out,” Knapke said. “You can't just focus on one or two players and stop them. Biggs, now in her seventh year, said this team is the most unselfish group she's coached. “No one cares who get the credit as long as we get the win,” Biggs said. Starting just three games as a sophomore, Kauffman is having somewhat of a breakout season, averaging 14.4 points. Biggs said her two leading scorers have put in the work to become a pair that's been nearly unstoppable thus far. “Anyone that thinks that you can be a really good basketball player and just show up for the two hours at practice is dead wrong,” Biggs said. “Those guys are in the gym putting extra hours in – one of the first few kids here getting extra shots up.